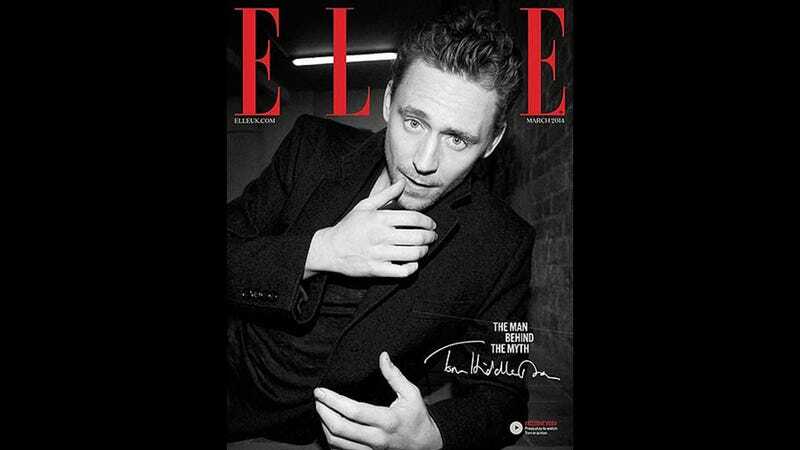 OMFG Tom Hiddleston looks so damn good on the March 2014 digital cover of Elle UK. Christ. Lily Allen is the real cover star, but we need to talk about Hiddles and the stuff he tells Elle UK's Annabel Brog, who got to have drinks with him for three hours. He talks to us about women. Wanna know about his first kiss? So did we: "First kiss 10! Yes, 10 years old, tongues and everything. [Laughs] She was a huge crush, we were in the same class, a lot of note swapping, and eventually it all went down in a cricket pavilion on an autumn night. It was very thrilling." His tastes have subsequently been refined: "I believe in the strength and intelligence and sensitivity of women. My mother, my sisters [they] are strong. My mum is a strong woman and I love her for it." Just give us a second, while we pick ourselves up off the floor. Oh, and there's this video of him running and panting and getting sweaty, which is oddly compelling. I thought he said see you in hell. And I was like, I will do whatever it takes to get there, babe. But he said "See you in Elle." Right. Sure. Thanks. Love you.